I’ve been a ham almost a year now, but due to my extremely low antenna (a dipole only 20′ high across my tiny urban backyard), I’ve never been able to make contacts outside North America. I’ve managed to reach 33 U.S. states so far — as well as Canada and a small Carribean island, I still haven’t hit another continent yet. The fundamental problem is that wires strung low tend to reflect energy off the ground, and thus the radiowaves hit the sky straight above the antenna; for real long-distance ionospheric skipping, one needs the radio energy to shoot toward the horizon. This is why I’ve been planning on putting up a higher loop antenna this summer. In any case, today I made my first breakthrough — a voice contact from Chicago to Italy. Finally! I thought it would be fun to participate in a low-power “backyard” contest today, so I set up my Buddipole in the center of my backyard, using the same 20 meter vertical configuration that I used on the Silicon Valley hilltop a couple of months ago. 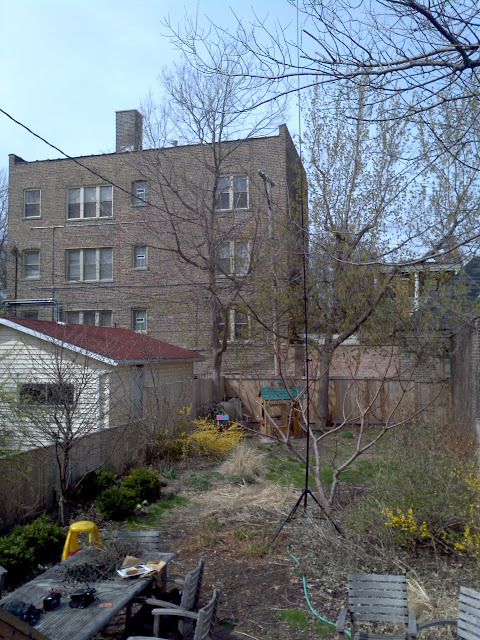 I’m still surrounded by other houses and buildings, but heck, a vertical antenna is known to hit the horizon easier than a horizontal one. Worth a shot! If you look at the photo, you can see the antenna is about 25 feet high. It’s not easy to see that there are also two wire radials sloping down to the side-fences, as well as three guy-lines. The winds were gusting to 20mph today, but the guys held the thing securely, despite the antenna swaying in the breeze just like the tall trees. At first I used low-power (5 watt) morse code using my tiny radio and a lead-acid battery, and made a nice contact with Salt Lake City, Utah (a new state for me!). I then made a basic voice contact with a guy in South Dakota; there was a busy contest going in that state this weekend. After that, just for kicks, I decided to drag out the BIG radio from the shack and run an extension cord for AC power. I turned up to 100 watts of transmission, and discovered a guy in Italy taking calls. After 20 minutes of hoping he’d hear my callsign, he finally acknowledged me and gave me a 5 & 7 report –not bad for 100 watts! The ionosphere was good for 20 meters today, and you can tell the sunspots are really picking up compared to a year ago when I first started out. In any case, this was a new distance record for me: about 4800 miles. In the picture below, you can see both my radios, with the tuner in the middle. 2 Comments to First cross-ocean contact! This is a great blog, I welcome you the world of amateur radio, its nice to know that mobile phones have not totally killed amateur radio’s interest. I also like the idea of using 5 watts only to see how far you can make contact. Thumbs up. 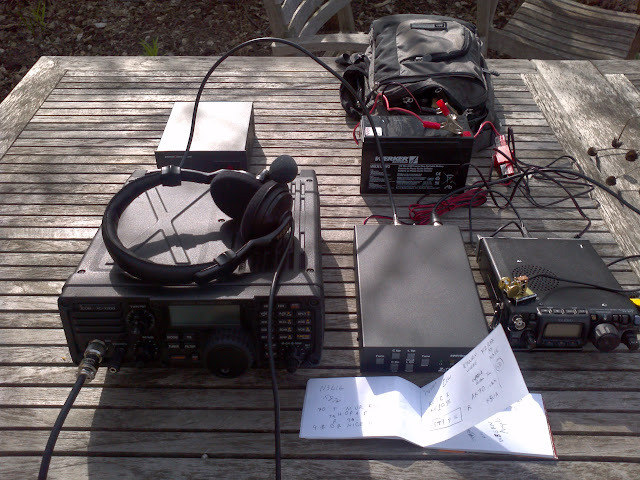 This is a great blog, I welcome you to the world of amateur radio, its nice to know that mobile phones have not totally killed amateur radio’s interest. I also like the idea of using 5 watts only to see how far you can make contact. Thumbs up.